Hand selected and hand beaded [of course], we've made you a 25+1/2" tutti fruiti combination of rock crystal and vintage pressed and moulded European glass beads. 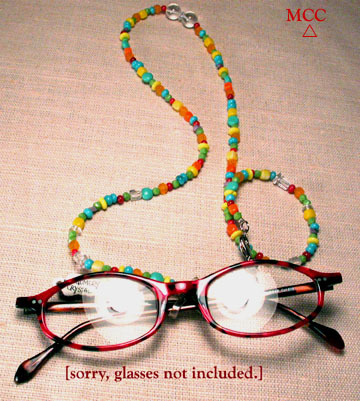 Keep both hands free while using your glasses, or detatch the eyeglass grippers [we've added an extra clasp and ring] and wear as a one of kind necklace. These bright colors and novel shapes will keep your spirits high!